In the Springtime, the machair of Iona becomes a carpet for rare wild flowers. Built on the crushed shells of marine creatures, this fertile, low-growing, herb-rich grassland (known in Gaelic as machair) is home to a myriad of wildflowers. The West coast beaches provide a valuable staging post for many migratory waders en route to their Arctic breeding grounds. 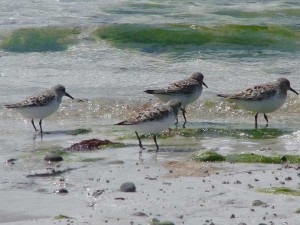 Enjoy getting up close and personal with mixed flocks of Dunlin, Ringed Plover and Sanderling, as they re-fuel before setting off on the next stage of their migrational journeys. 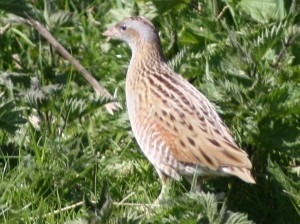 Iona is one of the best places in the UK to catch a glimpse of the rare and skulking bird, the Corncrake. They arrive from Mozambique in early April and make their home in the reed beds and irises. These birds have been in historical decline in the British Isles for over 150 years – agricultural changes have banished this endearing land rail to breeding outposts in the Hebrides. The unmistakable, ratchet-like ‘song’ of a Corncrake will assault your ears from within a patch of irises, yet seeing it will take some perseverance. Apparently, male Corncrakes can sing up to 500,000 times in a season before departing in September back to Mozambique for the Winter! The beautiful beaches also provide the chance to spot Oystercatchers, Eider Ducks, Common Sandpipers, Redshanks, Curlews and Greylag Geese. Fulmars nest on the west and south facing cliffs of the island, as do Shags and Cormorants. Otters can often be seen in the area South of Martyr’s Bay and Atlantic Grey Seals can be seen in the Sound of Iona between Fionnphort and Baile Mor, the main village on Iona. Both Atlantic Grey and Common Seals can sometimes be seen at the Bay at the Back of the Ocean. Basking Sharks and whales have been sighted in the sound, and are regularly seen on the various boat trips around the islands. Nothing beats a trip to from Iona to Lunga in May and June where you can sit and have lunch with the famous Puffins. They are actually much smaller than you may expect, but they are beautifully vibrant birds. There are no Red Deer on Iona and St. Columba (thankfully) banished the snakes!